Explore New York in 48 hours with your All Around Town Package Hop-On Hop-Off bus pass and ferry tickets to the Statue of Liberty Island and Ellis Island. 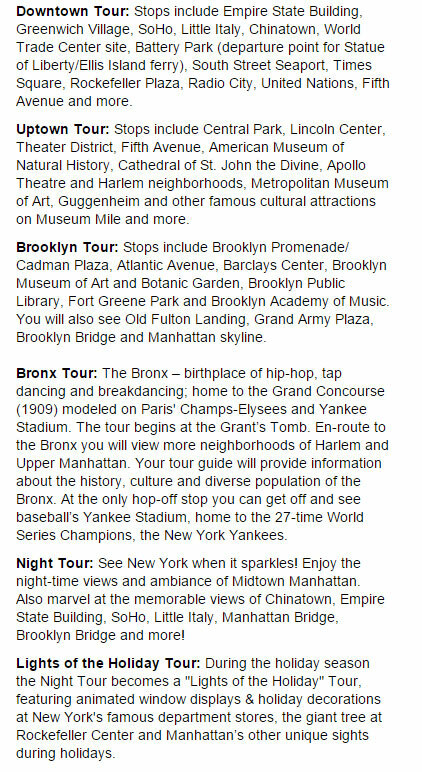 It's the ideal package for those who want to discover all the best of Manhattan. 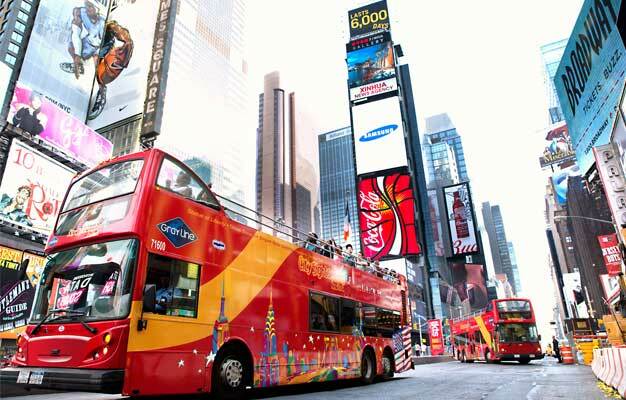 See the best sights and attractions in Manhattan with the Hop-On Hop-Off buses. For 48 hours, you can hop on and off as much as you like and really explore the city. There are over 50 stops with connecting transfer points to switch from one tour loop to another. The tours on the buses are operated in English and with audio guides in 11 languages. The iconic Statue of Liberty and Ellis Island are those places you simply have to visit at least once. Get on board the ferry from Battery Park and visit Liberty Island where you get close to the Statue of Liberty and continue on to the historic Ellis Island. Please note that there can be a wait to board the ferry and that tickets to the Statue of Liberty are not included, just the ferry ticket to Liberty Island. Shortly after your booking is complete, you will receive an e-ticket by email. Please print out your ticket and bring it with you to Gray Line CitySightseeing New York Visitor Center. When you get to New York you need to redeem your e-ticket for a bus ticket and ferry ticket to the Statue of Liberty at the Gray Line CitySightseeing New York Visitor Center. Your tickets are valid one month from the 'Valid from' date you choose when you book your tickets. Your Hop-On Hop-Off bus tickets are valid for 48 hours from the moment you pick them up at the Gray Line CitySightseeing New York Visitor Center. Your ferry ticket to the Statue of Liberty must be used within the same 48 hours.